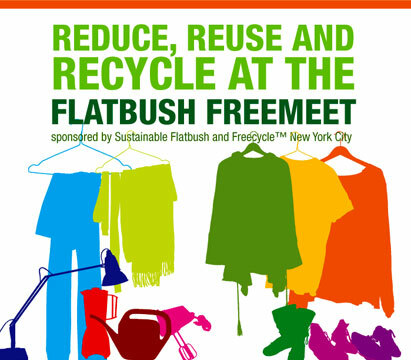 Browse: Home /	Events, Reuse, ZERO WASTE / Flatbush FreeMeet 2009! Directions: Q train to Newkirk Ave, F to 18th Ave, or B68 bus to Coney Island Avenue and Newkirk. Help reduce waste and keep our environment clean by finding new homes for your old stuff, and getting some things you can use in the process. Leftovers will be donated or recycled to every extent possible. Bring unwanted clothing, housewares and other reusable items to share* OR simply bring a tote bag to fill. Bring friends and family too! Everything at the FreeMeet is FREE! Got wire hangers? Bring ’em to the FreeMeet so we can hang clothes and recycle the hangers afterwards. * No furniture or heavy items, please. Bring portable items only and log on to http://www.Freecycle.org to give away furniture and other heavy stuff. More info on FreeMeet guidelines available here. In the knowledge exchange everyday people trade what they know for what they don’t know! books, crafts, shoes, kids stuff, etc. – Musicians: keep the event festive with happy sounds! We will hold an optional training session for volunteers (details below), but if you can’t make it just show up and pitch in on the day of the event! If you plan to help out please send an email to volunteer@sustainableflatbush.org to let us know you’re coming. Tags: 11230, Brooklyn, Flatbush, Freecycle NYC, FreeMeet, IF2030, NYC, RecycleTHIS!